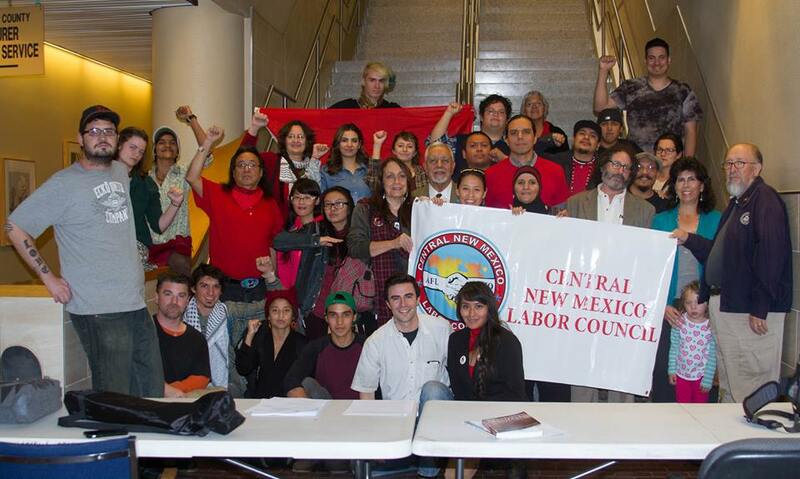 Last night Mon., Nov. 2, the Albuquerque City Council voted unanimously to legally declare the second Monday of October as Indigenous Peoples Day. The day is nationally celebrated as Columbus Day. On Oct. 7 the Council issued an Indigenous Peoples Day proclamation, which prompted more than a thousand to march Oct. 12 for the city’s first ever Indigenous Peoples Day. Native and non-Native community members also rallied under the banner of abolishing Columbus Day nationwide, upholding Native treaty rights, ending racist border town violence, and the eviction of corporate polluters from Native lands. The Indigenous Peoples Day resolution was the culmination of a full calendar year of organizing, coalition building, and education to bring people together under one banner of Native liberation. This happened because hundreds of people channeled their skills and willpower into making history and took to the streets to demand change. We are at the beginning of a new era for Native struggles. The Red Nation continues centuries of Native resistance to colonialism and capitalism. Indigenous Peoples Day is rallying cry to continue to press for progressive change and gain visibility for Native struggles. We still need more serious Natives and non-Natives willing to champion and fight the Native struggle. Whatever leverage and momentum we have, we have because we’ve never forgotten the promises and sacrifices made by previous generations of freedom fighters. We simply pick up that torch and move forward. Violence continues at catastrophic rates; sacred sites and Native land are still threatened; and Native people still experience rates of exploitation unparalleled in history. We look forward to uniting for the next forty years as we pledge more promises for liberation and justice. Next Call to Action: #NoDeadNatives in Gallup, N.M.